Sierra 2100 Pedestal Wood Stove- Manufactured by Sierra Products Inc. Proudly made in the USA. 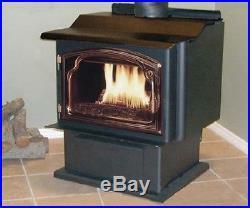 Includes: 1- Sierra 2100 PB Wood Stove – Black Door. Optional Gold (as shown) or Nickle Door Available for an additional cost. 31 (h) x 27 (w) x 25 (d) – 310 lbs – 6 Flue – EPA 5.7 – 11k-42k BTU Output. 5-8 hrs Average Burn Time. Stove is ready to burn right out of box. Option to Install a Blower Kit w/ Speed Control. Please view our complete line of other hearth products available on our page. Thank you for your interest! The item “Sierra 2100 PB Pedestal Wood Stove Heater” is in sale since Wednesday, December 16, 2015. This item is in the category “Home & Garden\Home Improvement\Heating, Cooling & Air\Fireplaces & Stoves\Heating Stoves”. The seller is “bbqsandfireplaces” and is located in Carson City, Nevada. This item can be shipped to United States.